The following chart makes this trend abundantly clear. The answer is deceptively simple, THE CLOUD. Today, Python is the only major language that is well-suited for handling Application Development, Data Engineering and Data Science. This allows organizations to build and maintain one set of coding skills across their entire solution architecture, resulting in leaner development teams, shorter onboarding times and increased collaboration between teams. 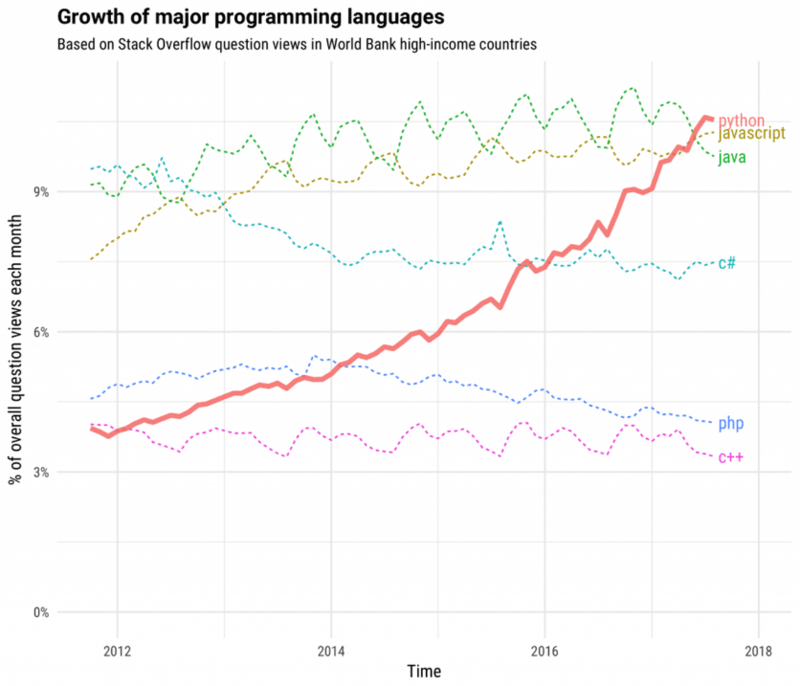 The reduced complexity of development also expanded Python’s audience to include Mathematics and Data experts who may not have as much background in traditional application development, further empowering the analytics capabilities of organizations. So, what does any of this have to do with the cloud? The cloud has been the single most important technological development over the last decade, empowering organizations to leverage data in ways that were once only possible by the most advanced organizations. Today, the ability to derive insights from data is a core requirement to stay competitive in nearly every industry. This leads organizations to invest vast sums of money into cloud-based data solutions comprised of tens, hundreds or even thousands of individual components. The ability to reach across the entire solution with a single programming language greatly reduces the development effort and “time-to-market” for new and innovative data solutions, all without paying a dime in licensing costs. That’s why Python is now the most popular programming language. Learn more about how Syntelli leverages Python to help our customers revolutionize their industries.